Japanese RPG fans, rejoice. Japan-based publisher Marvelous Entertainment announced a co-publishing partnership with L.A.-based XSeed, who's best known for Shadow Hearts: From The New World and Wild Arms 4 and 5. Through the deal, Marvelous, who among other titles publishes Natsume's Harvest Moon series, gains more North American presence, while XSeed gets to publish some of Marvelous' upcoming games here in the U.S.
Slated for a Fall 2008 launch, the first title they'll co-publish is Valhalla Knights 2 for PSP, a sequel to the April 2007 RPG that the two companies also co-published. Full release follows the jump. Torrance, Calif., (May 9, 2008) - Japan-based game publisher Marvelous Entertainment Inc. and Los Angeles-based game company XSEED Games announced today their entering into a strategic co-publishing partnership. The deal will help to establish a US publishing presence for Marvelous Entertainment and will provide XSEED Games an opportunity to access and bring to market titles from Marvelous' portfolio of high quality, popular games. Under the agreement, XSEED Games will support key Marvelous Entertainment titles for publishing and distribution in North America, with the first title to be announced under this partnership, Valhalla Knights 2 for the PlayStation® Portable (PSP), scheduled to launch in fall 2008. "We're pleased to be able to announce our new expansion into the largest gaming market in the world, the United States. I'm confident that together with our co-publishing agreement with XSEED Games, we will be able to hit the ground running as we ramp up our US operations," stated Yasuhiro Wada, Managing Director of Marvelous Entertainment. Jun Iwasaki, President of XSEED Games, shared Mr. Wada's sentiments. "We're honored to get the chance to partner with Marvelous Entertainment as they establish and grow their presence in the US market. They have an exceptional library of original and creative games many of which should prove a hit with Western gamers." Sequel to the popular Valhalla Knights, Valhalla Knights 2 promises to give fans of the original game a vast and expansive world to explore, and the customization tools to create the ultimate battle party. 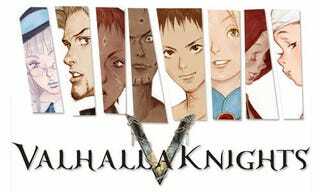 This action RPG (Role Playing Game) sequel adds new races, job classes, weapons, magic spells, foes, armor and more to the Valhalla Knights universe, within an engrossing story arc. Controlling and choosing character aspects such as skills, race, and appearance, players can engage in real-time 6 on 6 battles, reliant on tactical combat strategies to achieve success. Supporting 2 player ad hoc network play, gamers can engage in Co-op and Versus modes with friends, or simply trade items and weapons. "Valhalla Knights 2 will carry on the legacy its predecessor established as a beloved game in any RPG player's library," remarked Ken Berry, Marketing and Sales at XSEED Games. "We appreciate this game being the first in our co-publishing partnership with Marvelous Entertainment as it will help to set the quality standard high for all future games coming out of this deal." Marvelous Entertainment and XSEED Games will be announcing additional titles under this co-publishing deal in the near future, as well as more specific game details and assets for Valhalla Knights 2. XSEED Games was formed in November 2004, by a small group of industry veterans led by president Jun Iwasaki with a common vision; to cross pollinate the avid gaming culture of Japan and North America. Delivering unique, innovative titles across multiple platforms and genres, XSEED Games is dedicated to publishing products that appeal and enrich the North American market. More information on XSEED Games can be found at http://www.xseedgames.com.